The ankle is the part of the lower limb encompassing the distal portion of the leg and proximal portions of the foot. The ankle encompasses the ankle joint, an articulation between the tibia and fibula of the leg and the talus of the foot, which is described in more detail here . The foot is the part of the lower limb distal to the ankle joint. It is covered on its dorsal surface by loosely adherent skin and on its plantar/inferior surface by thick hairless skin that is tough and strongly adherent to the underlying plantar aponeurosis. The foot contains 26 small bones that are designed for weight bearing and force distribution. The bony alignment creates three arches the provide efficient weight distribution while avoiding compression of plantar neuro-vascular structures. The three arches, medial and lateral longitudinal and the transverse arch together create an architectural vault, which is one of the strongest load-bearing structures known to mankind . The dorsum of the foot has only one muscle (maybe 2 depending on classification). This is the extensor digitorum brevis (some authors name the most medial part of this muscle extensor hallucis brevis). Tendons are the main collagenous structures in the dorsum. The tendons connect anterior/dorsiflexor compartment muscles of the leg to the foot bones. Cutaneous innervation of the dorsum is by the superficial and deep peroneal/fibular nerves. Cutaneous innervation of the plantar aspect is by the medial and lateral plantar and tibial nerves. 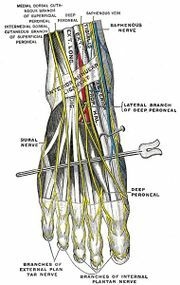 Dorsal motor innervation is by the deep peroneal nerve to extensor digitorum brevis and extensor hallucis brevis). Plantar motor innervation is via the medial and lateral plantar nerves (terminal branches of the tibial nerve). 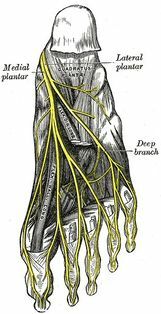 Arteries crossing into the foot accompany nerves of corresponding names. Therefore the anterior tibial or 'dorsalis pedis' artery, and the posterior tibial artery, are the terminal branches of the medial and lateral plantar arteries . ↑ Alazzawi S, Sukeik M, King D, Vemulapalli K. Foot and ankle history and clinical examination: A guide to everyday practice. World Journal of Orthopedics. 2017; 8(1): 21–29. ↑ Fraser J. J, Koldenhoven M. R, Saliba A. S, Hertel J. Reliability of ankle-foot morphology, mobility, strength and motor performance measures. International Journal os Sports Physical Therapy. 2017; 12(7): 1134–1149.